A longtime University of Wyoming English professor, who for years directed UW’s Honors Program, has been recognized with the UW Board of Trustees’ Award of Merit. Duncan Harris, who retired in 2014 after 44 years on UW’s faculty, received the honor during this week’s regular Board of Trustees meeting. The UW Trustees' Award of Merit was established by the Board of Trustees in 1984 to recognize members of the faculty, staff and student body who have rendered meritorious service or made exemplary contributions to the university. 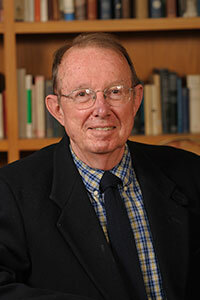 A Shakespearean scholar, Harris is an acclaimed author, editor and reviewer of many manuscripts in his field. For his teaching excellence, he was awarded the Ellbogen Lifetime Achievement Award in 2007, the Golden Apple Award, the Outstanding First Year Advocate Award and several others. For 21 years, he directed the UW Honors Program, tripling its size and providing extra opportunities for thousands of students. “Through his gentle and kind manner that challenges students to meet and exceed their expectations, he has mentored some of UW’s best students to prepare for, compete for and earn some of this country’s most superior scholarships,” a colleague wrote in his letter of nomination. Harris also directed the Summer High School Institute, which introduces outstanding Wyoming high school students to the university every summer. Harris received an A.B. in English, with a minor in history, from Stanford University (1965); an M.A. in English at Boston University (1966); and a Ph.D. at Brandeis University (1972).